Working with Piramal Realty on its first luxury development, Tekuchi produced a bespoke ApartmentFinder for Vaikunth, in India. Located in a unique natural setting and grounded in the principles of biophilic design, Vaikunth challenged our designers to create a beautiful interface with striking animations of its most recognizable natural branding elements. The Vaikunth ApartmentFinder presents the development and its surroundings in detail. 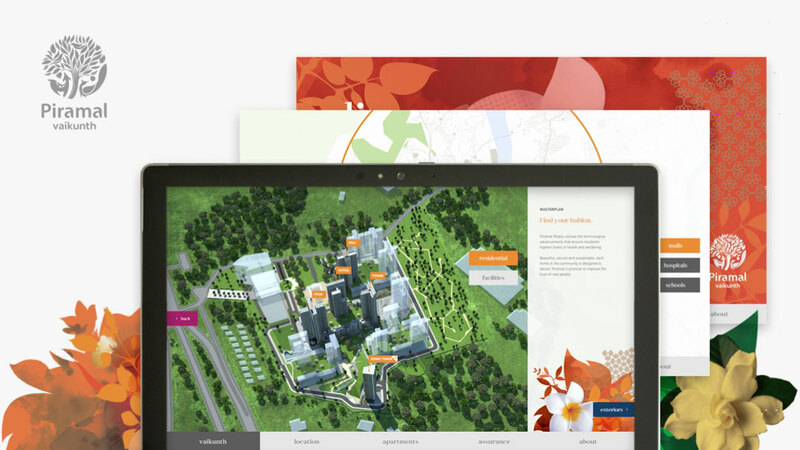 Vibrant and fresh, the application includes an animated 3D masterplan of the site and interactive location map. Going in to the apartments section, apartment details can be viewed by tapping the coloured overlays in the floorplate. The compare functionality enables the selection of up to three apartments from the different buildings, setting out its main information side by side. This feature is enhanced by the Media Wall setup that highlights the project’s main features and animated content. Our visualisation team created a custom-made animated 3D model of Vaikunth, used to showcase its masterplan and residential buildings. The top view of the development enables block selection, leading to a fly-in animation of the building selected. Each floorplate is modelled in 3D and the apartment areas are highlighted by coloured overlays in animated scalps.